These locations only require a $50 permit and will be added to your invoice. They are very popular with the local community, thus we highly recommend choosing a weekday if seclusion is important to you. Sherwood Forest is located on the East Shore approximately 40 minutes from Waikiki. It is without a doubt one of the prettiest beaches Hawaii has to offer. Its long stretch of white sand beach and crystal clear turquoise water creates a backdrop you will spend a lifetime reminiscing about. If a breathtaking Hawaii beach wedding is what you envisioned for your ceremony, this is where you want to be. Sherwood Forest Beach is recommended for those wanting a beautiful wedding or vow renewal in the sand. For packages with limousine transportation, this location does require one additional hour ($110). Recommendation: Sherwood Forest is available from 8:00 am to 4:00 pm. This is an excellent location for small or large parties. Transportation restrictions prohibit vehicles larger than 14 passenger limousines. Sandy Beach is located on the South East Shore approximately 30 minutes from Waikiki and shortly past Heaven's Point. This famous body surfing beach is known for its golden sands, dramatic lava rocks, and shoreline tidepools. Sandy's, as the locals call it, is the perfect blend between Sherwood Forest and Makapuu Beach. While Sherwood Forest is our top recommendation for a beach ceremony, Sandy's is an excellent choice if you want to capture the lava rocks in your photos. Recommendation: Sandy Beach is best from sunrise to 1:00 pm. It tends to become populated in the afternoon due to the wonderful surf! For packages with limousine transportation, this location does require one additional hour of limousine time ($110). Note: The State of Hawaii only grants permits from October-March. Other months are not available. Heaven's Point is located on the South East Shore approximately 30 minutes from Waikiki. It is one of the most stunning locations Oahu has to offer. From the lookout parking lot, you follow your photographer to the rocky cliffs below overlooking the turquoise blue ocean. Dramatically crashing waves create the perfect backdrop for your wedding photos. Given there is no beach access and guests are not permitted to follow the photographers during the shoot, we primarily use Heaven’s Point as a second location. For packages with limousine transportation, this location does require one additional hour of limousine time ($110). Recommendation: Heaven’s Point is best in the morning to the early afternoon. Couples without guests can choose this as a ceremony location; however, it is recommended as a secondary photo shoot location. Flat shoes are strongly recommended. Waialae Beach is located approximately 10 minutes from Waikiki. This is one of our most popular locations because of its natural beauty and close vicinity to Waikiki. It offers a vast variety of photo opportunities, from an elegant grass oasis surrounded by palm trees, to enchanting beach images with quaint islands in the background. Both Waialae Beach and Magic Island are great locations for couples looking to stay within the Waikiki area. Recommendation: Waialae Beach is best from 8:00 am to 6:00 pm. The main area at Waialae Beach is populated. However, where we perform the services, it is typically very secluded. Magic Island is located less than 10 minutes from Waikiki. It is a large park that offers a vast number of breathtaking photo opportunities. The view of Diamond Head, Waikiki, and golden Hawaiian sunsets make it the perfect location for couples looking to stay in the Waikiki area and have gorgeous sunset photos. 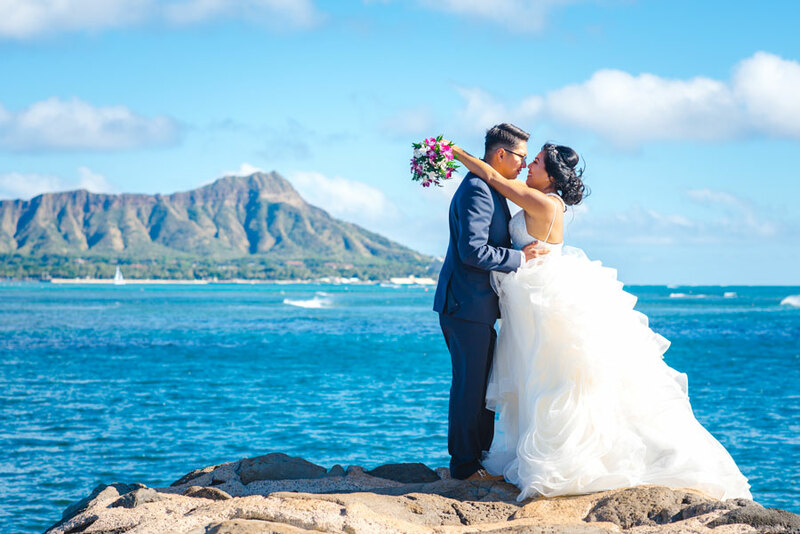 The ceremony is typically performed on the lawn overlooking Waikiki and Diamond Head followed by a photo shoot on a beautiful white sandy beach. Recommendation: Magic Island is best at sunset from Monday to Thursday. This is a very popular location for Hawaii residents on weekends; therefore, it is not a recommended location on Friday, Saturday, or Sunday. Available weekdays from 10:00-2:00, Liliuokalani Gardens is located in a residential neighborhood in Honolulu, yet the beautiful park is a calm oasis with a beautiful garden, relaxing stream, and lovely waterfall. You'll be amazed that an area so peaceful and secluded can exist only minutes from downtown Honolulu. Weekdays at Liliuokalani are very quiet, usually with only a handful of people around. You'll stroll down a paved walkway alongside a flowing stream, cross the bridge, and walk across the lawn to your ceremony site next to the natural waterfall. Recommendation: Liliuokalani Gardens is our recommended public waterfall ceremony location (for our premier waterfall location, see Pukalani Falls below). Although excellent for photos with the waterfall and lush surroundings, Liliuokalani is often paired with a second location beach photoshoot. Kawela Bay is located on the North Shore approximately 1 hour to 1 1/2 hours from Waikiki (depending on traffic). There is a majestic, tropical forest just behind the breathtaking beach making it the perfect venue for couples looking to capture a variety of “land and sea” images. We are often able to capture images with the “locals” - Hawaiian Green Sea Turtles - from a safe distance. Recommendation: Kawela Bay is not recommended for couples staying in the Waikiki area due to the distance between the locations. This is a popular beach for Hawaii residents on weekends. If possible, choose a weekday if seclusion is important. Additional travel fees do apply for North Shore services. Limousine service is not offered for this location. Paradise Cove Beach is situated on Oahu's West end just minutes from the Aulani, Marriott Beach Club, and the Four Seasons properties. Ko'Olina is known to offer some of the most pristine coastlines Oahu has to offer. Between the dramatic crashing waves, crystal blue water and direct view of the majestic, golden Hawaiian sunset, Paradise Cove Beach is sure to impress! Recommendation: Paradise Cove Beach is ideal for couples staying in West Oahu. Lighting is best between 10:00 am - Sunset. This venue can accommodate parties up to 20. A travel fee of $100 per vendor is applied to all packages at West Oahu locations. Because Paradise Cove is roughly 75 minutes from Waikiki, we recommend couples choosing a package that offers limousine transportation should remove this option from their package and receive a credit for this service. 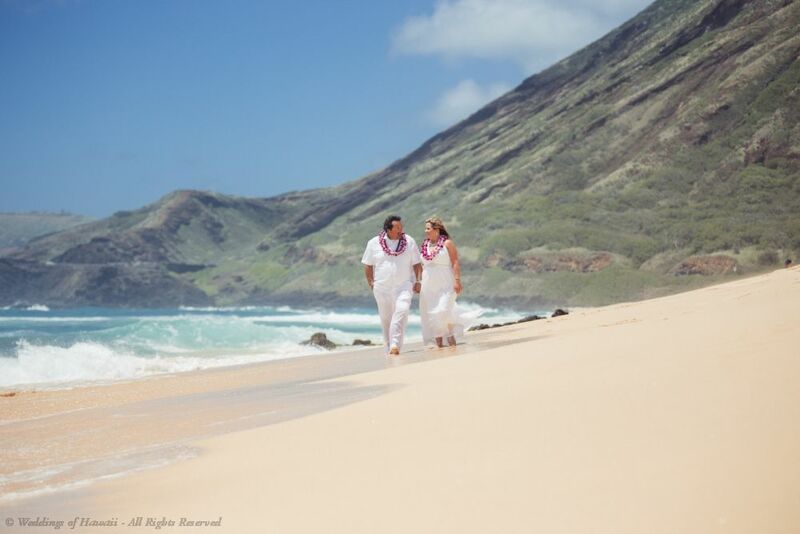 Sherwood Forest, also known as Sherwood’s Beach, is a beautiful stretch of sand perfect for your Hawaiian beach wedding. 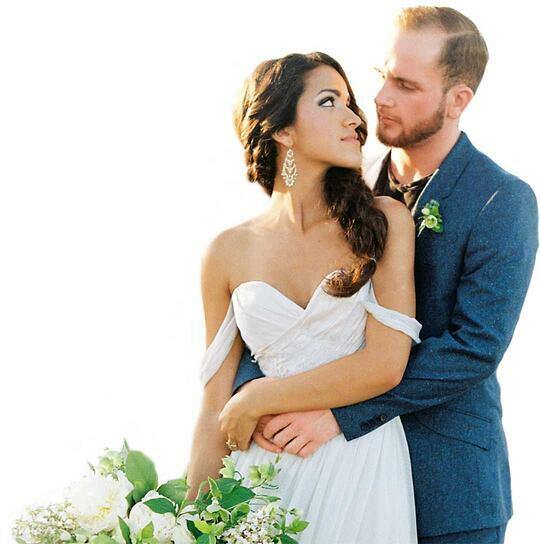 Located in the Oahu town of Waimanalo, Sherwood’s is one of our most popular wedding locations. The turquoise water, golden sand, and islands in the background provide the perfect backdrop for your ceremony. 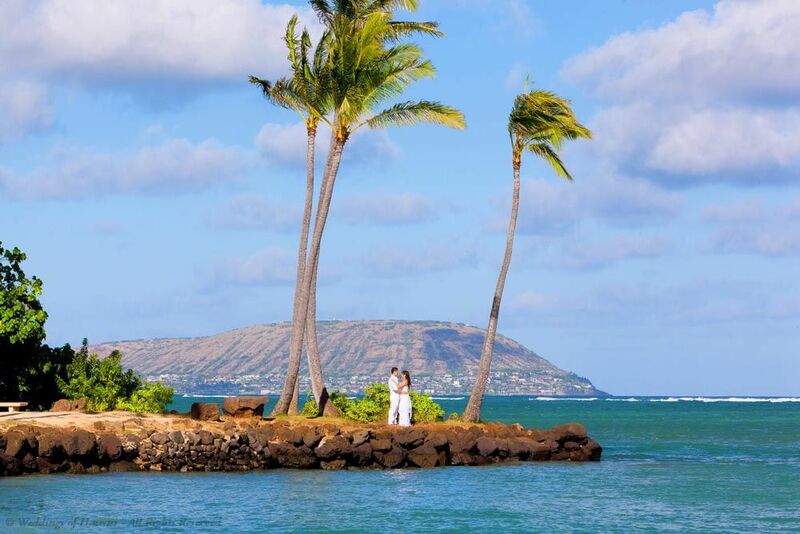 There’s no better location for a beach wedding in Hawaii. 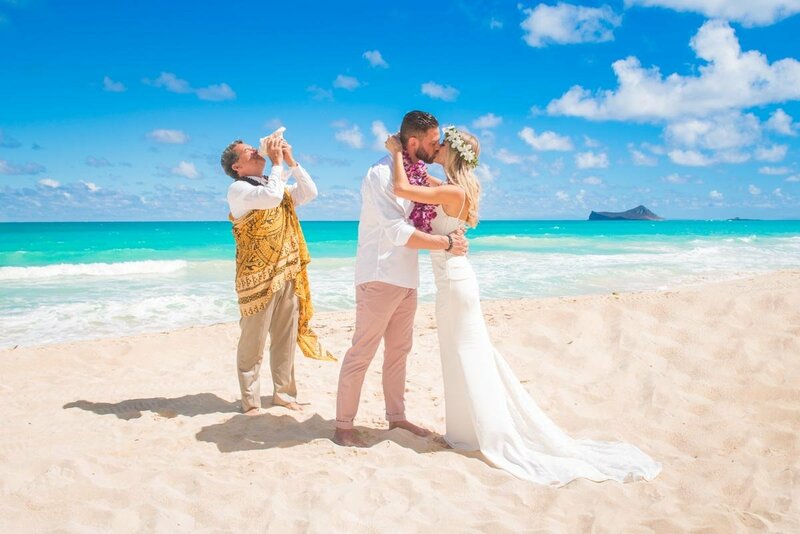 For the ultimate Hawaii wedding experience, we highly recommend considering a private venue for the ceremony and first photo shoot location. Recommendation: Koko Kai Garden is ideal for parties between 2-50 (street parking unavailable - a maximum of 18 vehicles permitted). Available Monday, Tuesday, Thursday, Friday, and Saturday between 10 am and 3:30 pm. 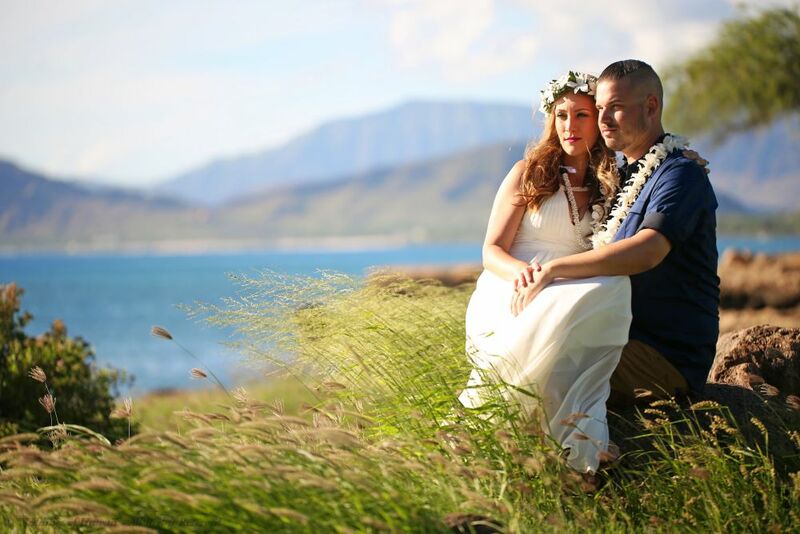 Incorporating a second location to capture beach or rock images creates the perfect Hawaii wedding album. For packages with limousine transportation, this location is just outside of Waikiki and is subject to one additional hour of limousine time ($110). 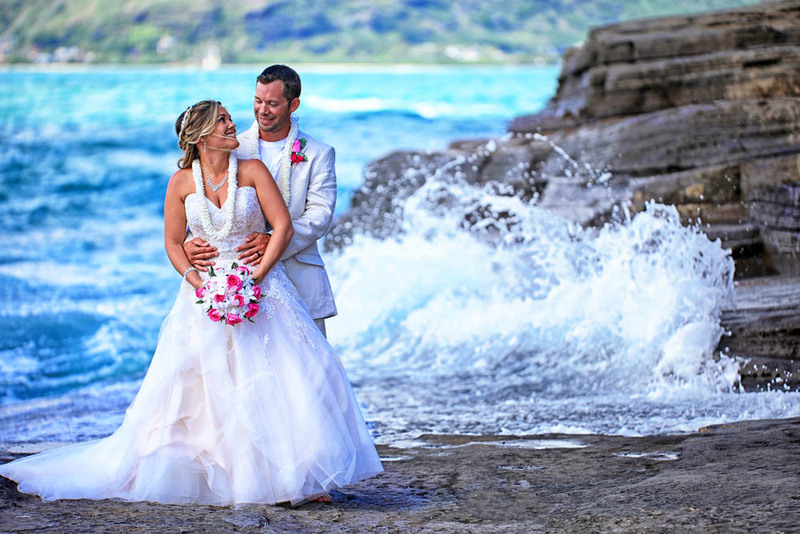 A Weddings of Hawaii Premier Location! 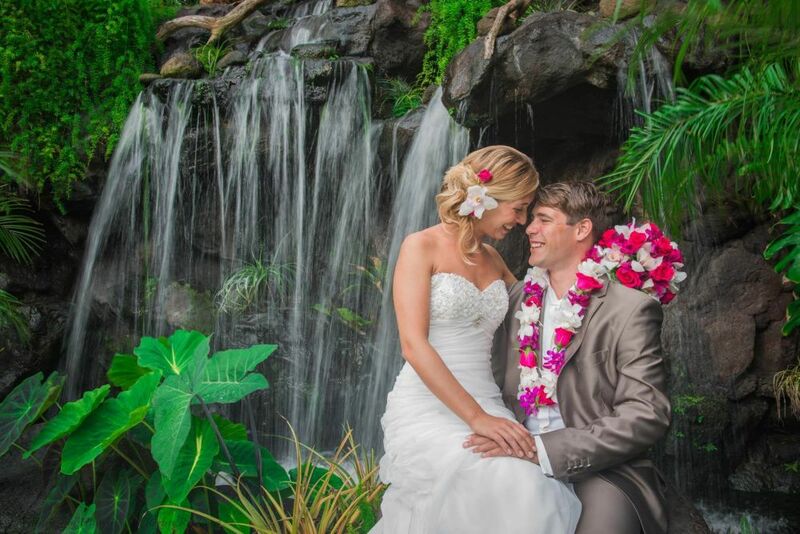 Pukalani Falls is the ultimate private waterfall and tropical garden oasis and is now available to Weddings of Hawaii's couples! Pukalani Falls Garden is our premier private location, only 40 minutes from Waikiki. Its breathtaking beauty is enhanced by exquisite cultural art, majestic koi ponds, tropical birds, stunning lush Hawaiian gardens and more! These features provide unmatched photographic opportunities for your special day. This magical wonderland, also known as the Hobbit House, was even featured on HGTV’s national Home and Garden Show as a one of a kind wedding day destination! Pukalani Falls is what dreams are made of. Recommendations: Captain Howie is the exclusive officiant for Pukalani Falls. It is available for $495, Monday through Saturday from 8am-4pm. This location has a maximum capacity of 25 people. This venue is best utilized as a waterfall ceremony location or second location photo shoot. The combination of the falls and Sherwood Forest creates a spectacular photo album (additional fees apply to single location wedding packages). For packages with limousine transportation, this location does require one additional hour ($110). Marina Chapel is a hidden gem on the East Shore approximately 30 minutes from Waikiki. This brand new chapel has gorgeous views of the Hawaii Kai Marina and a private patio for an intimate ceremony. 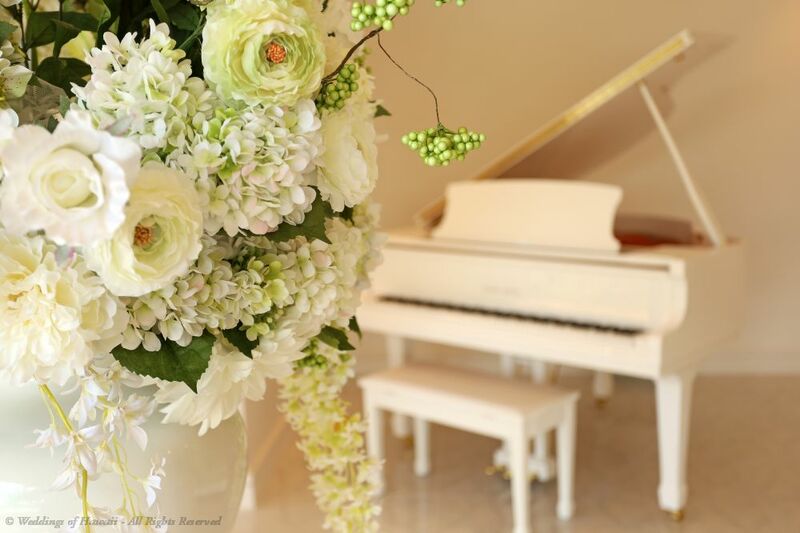 There is elegant white bench seating, a stunning bridal salon, and a shimmering white grand piano! Ornate white silk floral arrangements and seashells line the aisle for the beautiful, beach chic bride to walk down. 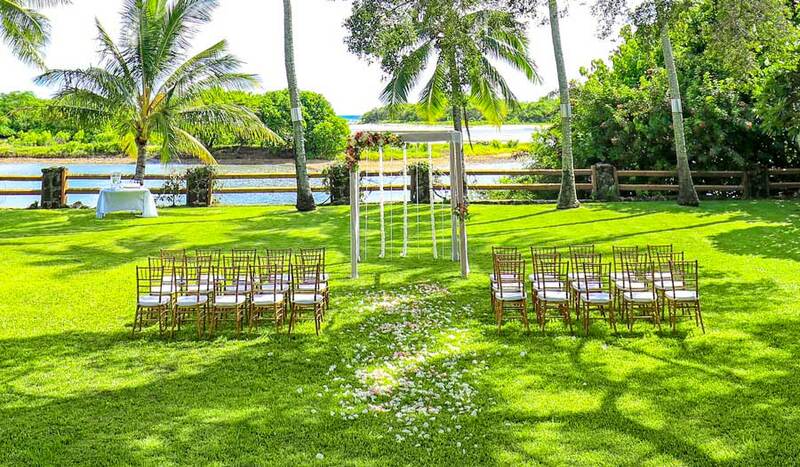 Marina Chapel is perfect for couples wanting a covered ceremony while still including the beauty of Hawaii. The chapel looks out to the Hawaii Kai Marina, offering beautiful views during the ceremony. For packages with limousine transportation, this location does require one additional hour of limousine time ($110). Recommendations: Marina Chapel is available for $749. Please ask your wedding coordinator for additional information and to check on availability. The chapel can accommodate up to 30 guests. Pukalani Falls is the ultimate private waterfall and tropical garden oasis and is now available to Weddings of Hawaii's couples! Pukalani Falls Garden is our premier private location, only 40 minutes from Waikiki. Its breathtaking beauty is enhanced by exquisite cultural art, majestic koi ponds, tropical birds, stunning lush Hawaiian gardens and more! 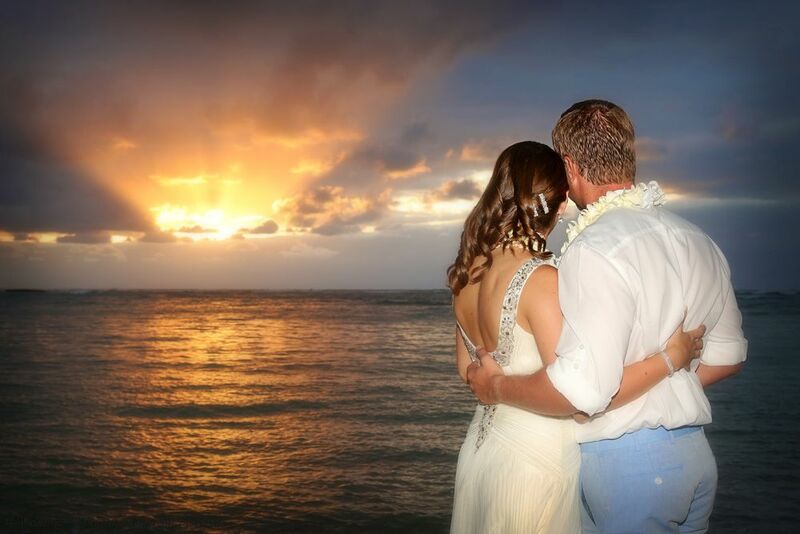 “We are so thankful that we chose Weddings of Hawaii for our special day. 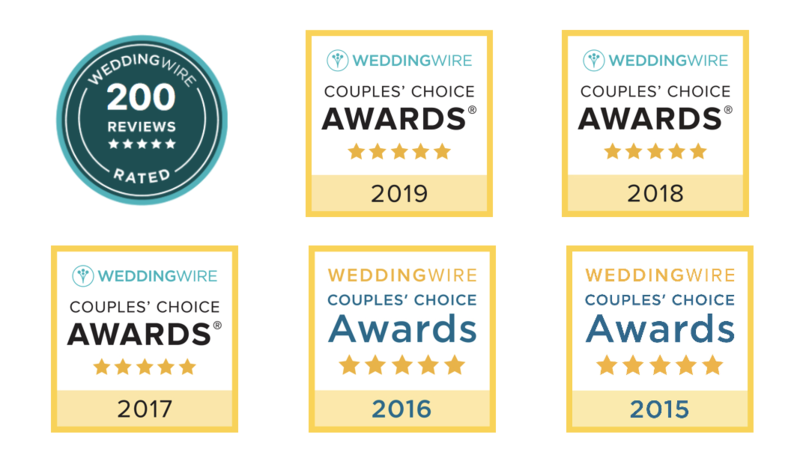 We researched many vendors before deciding on Weddings of Hawaii, but after seeing sample videos with Reverend Russ as the officiant in them, and speaking to the team via emails, our decision was easily made."